I’ve been in the broadcast news/technology game since April 1st 1998. Yes, that’s right. I started my career in TV on April fools day! An omen (+/-) if ever there was one. I’ve had many incredible experiences over those 19 years. Working as a broadcast support engineer, technical production manager, producer, director, cameraman, editor, trainer, mentor. The highlights of my career have been the people I have had the privilege to work with. I’ve met so many talented people who have inspired me and many I now call friends. I met my wife Fiona while working in TG4. I started this blog in October 2010. At that stage in my life I had passed through my darkest and most tumultuous period, leaving my home in Galway and starting again, pretty much from scratch in Dublin. It was all upheaval, change and scary as hell!. With that new beginning came new opportunities, it just took me a while to get my sh*t together and refocus. I can say with complete honesty I wouldn’t be here today were it not for the patience and support of Fiona. In the years since, I have put a huge amount of my time and energy into continuous research in the mojo space. I’ve also come to the conclusion that “Mojo” is not actually limited to the use of a smart phone for storytelling but is in fact a mind-set, predicated on the idea of the individual as a multi-media content creator/storyteller. If you use a drone, a 360 camera, a gopro, a dslr to film or a laptop instead of an iPad to edit, should that preclude you from being called a “MoJo”? I think not. 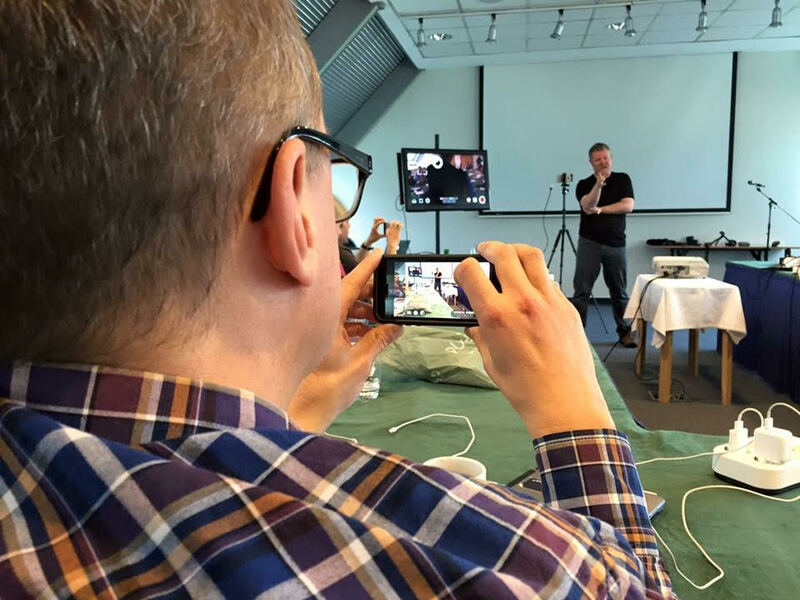 I started Mojocon in 2015 because I was becoming frustrated at the slow adoption of mobile journalism in broadcast organisations around the world-particularly ones where I had delivered training. I became annoyed when I received emails from former mojo trainees who had been told that their TV stations would not broadcast their finished mojo reports because the “quality did not meet minimum technical standards”. I had heard exactly the same argument years earlier when I was involved in the introduction of video journalism. Change is never well received in traditional organisations. The idea for Mojocon was to bring the growing community of mobile storytellers together to share their experiences, techniques and knowledge. I wanted the conference to have 3 objective: Inspire, Equip and Educate. The Inspiration came from the stories shared during the plenary sessions. The Equip came from all the hardware and software manufacturers who came to exhibit their solutions and the Educate came from the workshops run by a selection of the speakers. I’m happy with what Mojocon has achieved in the three years I’ve run it. I have to say that were it not for the support of my boss Richard Waghorn, it never would have happened. The resistance I met along the way when trying to get the concept over the line is unbelievable-yet through perseverance and with Richards determined support it became a reality. Philip Bromwell, Eleanor Mannion and a small group of other staff (you know who you are) have almost single handedly pushed the boundaries of Mojo over that period and I can say with absolute confidence that Mojo in RTÉ will continue to grow (and hopefully thrive) after my departure. -the lack of funding for research or development work. When I applied for the role I specified that Innovation would need a research and development fund, but because of the financial situation in RTE over the last few years that budget was not allocated. Its hard to experiment and innovate when you have to “make do and mend”. -the fact that I am at a glass ceiling in the organisation and cannot progress beyond my current position of Grade 1 manager reporting directly to a member of the RTÉ executive, the CTO. -and many more things but I guess one of the biggest drivers is the realisation that the new structure that has been announced will ultimately result in RTE doing exactly the same thing but with a different team at the helm. An opportunity to rethink WHAT RTE DOES and HOW RTE DO IT may be missed and this could be the last chance to realign the organisation, the idea of digital disruption is still eyed with suspicion and ridicule. When I enquired about Innovation and where it would reside in the new structure (I had pitched for an Innovation team, drawn from across the company, ring-fenced with scope to break, fix and fix better) I was told “there will be no specific team, we all need to be innovative”. For me the vision of where mojo can fit in a newsroom, any multi-media newsroom, is crystal clear. As technology improves and as AI goes mainstream I can see clearly how a virtualised (cloud based) mojo newsroom is the best way forward in realising the potential. I believe much of the resistance in “traditional” media is borne out of a knee-jerk response to attempts to shoe-horn mojo into traditional newsroom infrastructure, disrupting the status quo. “Its not 4:2:2“, “the frame rate is not exactly 25fps” “the audio is not good enough” “we have to convert progressive to interlaced” “no one supports or wants 4k“ – all these protests have been fired back at me as reasons why mojo cannot be implemented. In a traditional newsroom these protests may have some validity but they fall away when you see mojo for its true potential: an end to end news ecosystem in its own right. If we consider developments in cloud infrastructure, AI, 5G and mobile tech then there is real potential in a virtual newsroom that can be spun up without any substantive* (by comparison to a traditional newsroom model) capital investment and it can operate above/outside the traditional newsroom structure but by leveraging cloud based transcoding delivering “ready for ingest/broadcast” content at the END of the workflow. The reason that the tv content should sit at the end of the workflow is that the key drivers of mojo are trust, credibility and immediacy – truly mobile FIRST and leveraging the platforms where the audience reside in realtime to get the content to them-as distinct from UGC. For the audience who continue to watch linear scheduled news on TV, the content from earlier in the pipeline can be repurposed into more traditional/explainer/analytical style reports. Sure, don’t throw the baby out with the bath water. If there is a viable audience for the linear output and they want your content then “Give it to them” but if there is also an audience for different types or versions of stories on social media then “Give it to them too”. We (the broadcaster/media company) serve the audience. If we don’t give them what they want (our USP is credibility, accountability, trust, ethics etc) then they will happily migrate to one of the myriad of startups flourishing in the social vacuum we have allowed to grow. Keep an eye on Facebook, Mr. Zuckerberg has his sights set on video news. Remember mobile technology is ONLY GOING TO GET BETTER and recently, as I watched the launch of the iPhone 8/8+ and iPhoneX one thing DID catch my eye and it wasn’t about the iPhone it was about the new Apple TV-4K. There, buried in the slides was a sign of the future of mojo-news. SVT and SKY have already partnered up with Apple to get their content on the OTT Big screen. I’ve tweeted about this a lot recently. Playlists on the AppleTV Facebook App are (algorithmically) addictive. Of course you can always Airplay (or Chromecast) content from your smartphone to the big screen if you have an appleTV/Google Chromecast. The potential of a Mojo, cloud-based, AI enhanced, newsroom could be a mixture of shortform social content throughout the day and then a HBO/VICE style evening news show on the “big screen” via Apple TV which is tailored to the viewers preferences and from peer/friend referral. Sure, some “News you MUST know” and algorithmically selected items wouldn’t go astray either but the true potential here would be to shift some of the money from the million Euro technical infrastructure used to create linear TV news production into a non-linear distributed, virtualised service where the money is spent on 1. People and 2. Stories – for that is where our true creative potential resides. We are entering a phase of exponential disruption. My last day in RTÉ will be Friday December 15th. There are opportunities to be explored beyond Donnybrook, other organisations and companies who don’t have baggage, companies who are more open to change and ready to listen. Above all there are companies who actually understand that to be innovative one must try. Create a structure, assign roles, agree deliverables, fund them, break things, fix things but above all else try and in doing so understand, failure is perfectly ok. For me, that is the essence of Innovation. This WILL likely be the last post on this blog. Once I leave RTE my plan is to start a weekly vlog and to do more live stream AMA sessions. My energy will go into training and consultancy. I have just launched an online/ e-Learning mojo course in partnership with the Thomson Foundation http://www.thomsonfoundation.org/e-learning/ and I have some other exciting initiatives to reveal in the New Year. TV VJ is done. Its been a blast! RTÉ own the brand and the idea (even though it was my concept) I’ve been told that RTÉ will run another event after my departure with a view to “scaling and monitising it”. My vision was always that the event would be not-for-profit and only seek to cover its own costs, it’s perhaps appropriate that as the event is getting a new direction it also will have new organisational leadership. For my part I intend to host at least one mojo event in Europe in 2018, (I just can’t call it Mojocon), but I’ll take the opportunity to rethink the event and to try make it more inclusive and more accessible. Stay tuned. I created an interactive image exploring them recently and now I need to add a new one to the mix. Welcome the Rode i-XLR. Note the return audio to the headphone jack on the i-XLR depends on whether the App you are using supports the feature. Monitoring is also possible via the (soon to be obsolete) headphone socket on your iOS device. This is the live broadcast (Using Tieline Report-IT Live) and pre-recorded clips Cian made for Morning Ireland using the i-XLR. Click this image to access a Thinglink interactive image with links to all the microphones mentioned. These key drivers are reasons, in my opinion, why mobile is going to continue to evolve and come to dominate the media industry. Sandisk recently launched a microSD card with 200GB capacity. Most smartphones rely on brands like Sandisk for their SSD/flash memory, so watching developments and new products from these manufacturers delivers an insight into future storage trends. In the next 5 years the nano-scale manufacturing process which are currently being developed will further improve the capacity of micro storage and enhanced connectivity will further drive cloud based backup and remote storage solutions. By 2020 it should be possible to cost effectively deliver 1TB of local storage in a mobile device with unlimited cloud based storage*. Every year at Mobile World congress Imaging Sensor manufacturers deliver the latest breakthroughs in Image sensor quality. If you take the combination of currently available multi camera solutions like the LIGHT camera and lightfield technology like the LYTRO and combine it with the continued evolution of core image sensors it is feasible that by 2021 smartphones could easily be equipped with 50Megapixels sensors shooting UHD4K video as standard (without the current limitations of storage and battery issues) Still Images will be near DSLR quality and continued development of Apple’s Lightning based MFI programme and expansion of the USB OTG standard for Android devices will mean that external camera modules will be the solution to overcome optical image magnification issue. 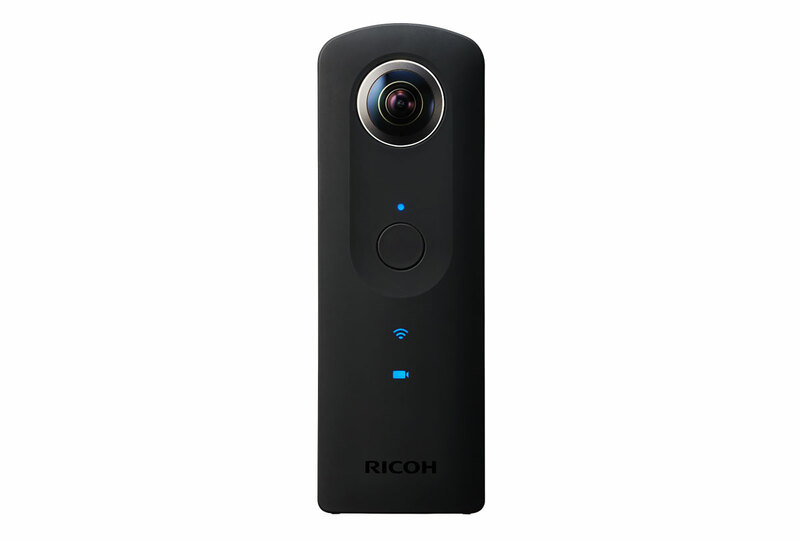 Devices like the DXO One, Flir One, Seek Thermal camera and the Insta360 Nano indicate that the “Add On” camera module market has huge potential going forward offering diverse solutions for different markets. The current achilles heel of every smartphone/tablet is limited battery life – particularly if you are using them for processor intensive activities like shooting 4K or editing. Battery technology however is benefitting from a boom in research and development investment. Companies like TESLA are driving all other car manufacturers to offer all electric vehicle solutions and that future demand is in turn driving even more research into advanced energy solutions. A recent report on EV market growth indicated a 300% growth to over 3million vehicle sales globally by 2021. That will place huge demands on battery manufacturers to develop and deliver more efficient battery technology – principally to overcome “range anxiety”. The smart device industry will benefit in kind from these developments.. Probably the biggest evolution over the next 5 years will be the launch and roll out of the 5G mobile standard. This will deliver peak connectivity data transfer rates of between 1Gbps and 10Gbps. Aside from playing a pivotal role in the Internet of Things and connected devices this means that delivering high resolution 4K video on demand or indeed live-streamed will become a viable offering. The mobile device could in time, be more than just a control surface for your smart/connected home it could become the defacto OTT solution for 4K delivery to your large-screen 4K TV for shared experience social events (Sports/Movies) but equally be your personal 4K screen for news and niche/social/personalised content. Even though 5G will bring substantially better bandwidth, users will still be mindful of data tariffs, particularly when roaming. As the trend towards more video continues and as the development of 360 video content grows exponentially it will be necessary for new video codecs to make compression more efficient. H.265 otherwise known as HEVC is the most well known (and likely) successor to MP4/H,264 upon which most mobile video and web video traffic runs currently. However HEVC appears to be fraught with expensive patent licencing and this may in fact stifle its adoption. Companies like Cisco (Thor) Google (VP9) and others including Microsoft, Amazon, Netflix and Intel have formed a strategic alliance to create an alternative to HEVC. With brands like those mentioned driving the evolution of the next generation video codecs you can be sure that by 2021 4K or even 8K delivery will be a reality and if current video consumption trends are anything to go by, mobile will be a key beneficiary of those developments. Apple has had “Retina Display” screens on some of its mobile devices for a number of years now. Retina Display refers to devices and monitors that have a resolution and pixel density so high – roughly 300 or more pixels per inch – that a person is unable to discern the individual pixels at a normal viewing distance. The key part of that description is NORMAL VIEWING DISTANCE. What is guaranteed to change over the next 5 years is the normal viewing distance of your mobile. Consider if you will, what happens when you put your mobile device into a VR Viewer like Google Cardboard. The two lenses magnify the screen to give you a limited field of view which create the effect of a sterescopic image. They also magnify the pixels meaning that current viewing experiences are pretty poor. Now consider the fact that Sony has already released a 4K resolution smartphone (the Xperia Z5 Premium) with 806PPI (thats more than double Retina Display) but it means that the pixel density is so dense that even when magnified in a VR Viewer the dots should be substantially less noticeable leading to a much more immersive and higher quality VR experience. Also, for the time being neither Youtube or Netflix offer 4K streams to smartphones- why would they? The bandwidth is not there over 3G and even if it were over Wifi there is no phone (other than the Xperia Z5) which can view the content at full res. However if you take the other driving forces mentioned (Storage, Optics, Battery, 5G and codecs) you will see that by 2021 4K or higher will be an absolutely viable platform for mobile. The jury is still out on whether Immersive experiences will be the “next big thing” or the next 3DTV. For what its worth I think Immersive is going to grow exponentially over the next 5 years (with a few* caveats) Having experienced Facebook’s Oculus Rift I can absolutely see how Virtual Reality will fundamentally change the way people experience gaming. I think it will also have a huge impact on tourism, real estate, shopping and education. Once users have passed their initial *WOW* factor experience the challenge will be creating content which really utilizes the experiential nature of VR/AR. The thing is, the amount of people who will spend $600 on an Oculus Headset plus an additional $2000 on a powerful enough PC with a super Graphics Card to drive it, will be quite limited. However Mobile, as it will evolve over the next 5 years, will become the point of access to 360 Video | AR | MR | VR for the majority of users. Couple with this the continued growth of wearable technology, watches, glasses, sensors etc and the SmartDevice will become the thread that binds the user of 2021 to his/her digital, experiential, connected self. I know its been a while since I posted to the blog and I have to admit I’m struggling to find the time to maintain it. When I started this (over 5 years ago) I was newly single and in a new role in RTE so finding time to research and share was no problem. Now with two wonderful kids and a wife to consider, my evening are precious and with that comes the struggle to balance priorities and interests. That said I’ve wanted to post this for quite some time…I’ve been a huge fan of UAV’s/RPAS/Drones since the launch of the DJI Phantom 1. The market for unmanned aerial vehicles has exploded over the five years since and the quality, features and range of models has grown exponentially. I’m still flying my Phantom 2 and have been tempted on many occasions to upgrade to either the Phantom 4 or the 3DRobotics Solo but for now I’m cash strapped so will have to make do and mend. However there is one new area of Drones that is now starting to gain momentum: SubAqua. I’ve been patiently waiting for a cost effective, HD/4K underwater camera system and in the last few months a few interesting ones have *surfaced*. This company, based in the US, have 2 main Subaqua Drones. The Endura and the HydroView. Interestingly no prices are listed on their website (I have requested a quote) but the videos from the Endura look pretty good. Arguably they could do with a 3 axis gimbal with “soft follow” to stabilise but the most impressive thing is the depth. The Endure 300 can dive to 300m although it comes with a 100m tether out of the box so presumably you have to buy extensions to reach that depth. Will update with price if I receive a reply. ***UPDATE: The Endura 300 starts at $25,000 and the Endura 100 $17,000. You would want to be a pro user for that pricepoint. The TTR Seawolf is a cheaper solution and aimed more towards the enthusiast. Again it is a tethered solution but in this case the depth is limited to 25m-60 meters depending on model. Interestingly one of the versions of the Seawolf has a VR/360 cameramount which in their promotional material shows a LUNA 360 camera attached. The Luna 360, recently funded via IndieGogo is waterproof and submersible. The iBubble, recently successfully crowdfunded via Indiegogo, follows in the footsteps of the aerial equivalents of autonomous drones like the hexoplus, airdog and Lily. The iBubble will autonomously follow a tracker bracelet underwater, which has 8 pre-programmed camera moves but can be switched into manual operation mode or used as an underwater handheld camera. It’s target RRP when finally released* is expected to be around $2000. If you are technically minded you could go the open source / DIY route and explore the OpenROV project. Kits are available to buy/build from $899 – $1399. If you know of any other subaqua drone projects please let me know in the comments section. Equally if you own one and have some interesting video to share please post that also. 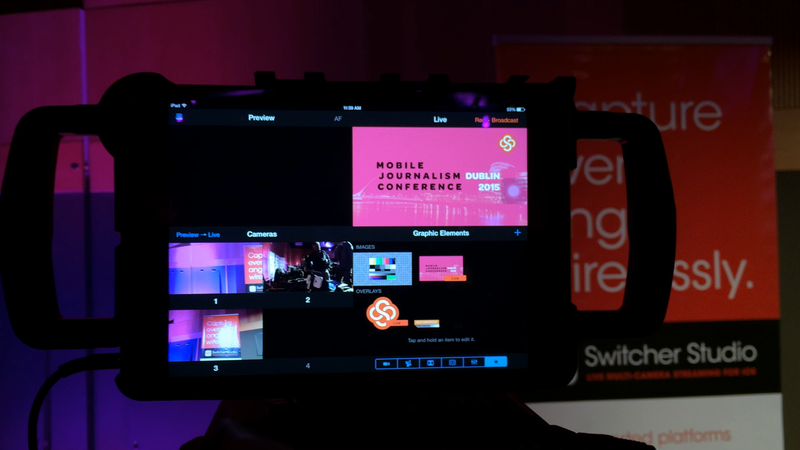 I’ve written previously about the evolution of RTÉ’s Mobile Journalism Conference: Mojocon. In April this year we will host the second RTÉ Mojocon and once again we are shining a spotlight on the activities of broadcasters, publishers, NGO’s, businesses and educators who have pushed the boundaries of content creation using smartphones and other digital consumer technology. This is my second time organizing a conference and though it was an induction by fire the first time around, I learnt a lot of extremely valuable lessons from Mojocon 1. Probably the first lesson was understanding the phases of the planning. The Pre-production phase involved eight re-writes of the business case over three months with each one having a substantial reduction in the proposed budget. Once the final business case was approved the next phase began: Initial logistics. Venue, dates and draft session lineup. After multiple quotes have been received and a venue is secured, we then move to announcing the conference with a “save the date” campaign and so begins the process of finding major sponsors for the event. It’s worth pointing out that RTÉ run Mojocon on a not-for-profit basis. From its very inception over two years ago the entire concept pivoted on the idea that at the core of Mojocon is the intention to bring together a growing global community of people who are interested and can see the potential in mobile content creation. I think the non-profit aspect is one of the key things that separates RTÉ Mojocon from many other journalism related events. That said, the cost of hosting an international standard conference for 500 delegates; venue, catering, travel and accommodation for 40+ international speakers, pr and marketing etc. all add up very quickly so major sponsors are absolutely essential to making the event a success. Without them the ticket prices would well exceed €500 and in my opinion render the event unfeasible. We were extremely fortunate to have Sennheiser, an international audio solutions manufacturer, come on board very early into the process. When Google News Lab subsequently joined the conference as sponsors things really started to take shape. Now, with just eight weeks to go, we are in the exhibitor and delegate ticket sales phase and it is this part that always leaves me somewhat bewildered. Over the course of the last two months I have reached out to over 80 companies inviting them to participate in the event as exhibitors, or in an ideal world sponsor/exhibitors. The thing that really frustrates me is the repeated cycle I’m seeing in the negotiation process where, as soon as I mention the delegate numbers are 500 I get a “Oh, is that all” response. This is where the case for Boutique V Behemoth really kicks in. I would love to do some market research on the BIG conferences referred to above. As part of that I would like to see for each exhibitor who takes part in those multi-thousand attendee events how many make connections of real value. I would measure connections of real value in three ways: 1. Immediate conversion to a sale. 2. Viable lead for a post conference sale 3. Important and strategic contact in the target market. 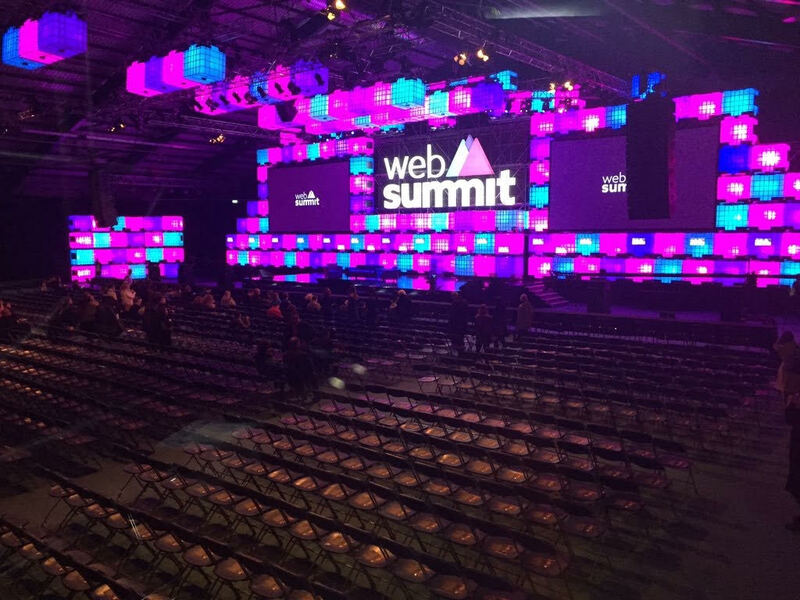 Last November I attended The Web Summit for the very first time. Follow the link if you don’t know anything about the Web Summit. It has been heralded as one of the great success stories in recent years for the digital economy in Ireland. That perhaps was the case until co-founder Paddy Cosgrove announced in October 2015 that the event was moving from Dublin to Lisbon from 2016 onwards. Without digressing into the debate about the reasons why I will simply say that I am sure Paddy and his team had good reasons. From my perspective, Websummit was a behemoth, like Mobile World Congress Barcelona, or NAB Las Vegas or IBC Amsterdam. A huge, sprawling multi location complex of stands and talks with 30,000 delegates trying to find something useful to do with their 8 hours in the venue (a substantial amount of which is spent queueing to get from talk A to B). I’ve experienced this myself at MWC and IBC. You can meander around hall after hall looking for interesting technologies and solutions but instead of finding them you end up bumping into familiar faces again and again and asking them have they seen anything really interesting and worth checking out. I attended MWC just once and found it utterly head wrecking. At WebSummit I had one day where I really worked hard to navigate the halls teeming with startup alpha and beta’s who, once they noticed your badge said “Media” would instantly pounce in you to “Come meet our CEO/CRO/CTO/COO etc”. I have to be honest, the idea that a startup with three staff has a CEO,CTO and COO does make me wonder! The consensus from Media people I met was that they were actively hiding their media accreditation to avoid the “vulture effect” it induced. Don’t get me wrong here, I fully appreciate WHY this was happening, but it felt like utter desperation. I can see from a profit point of view how economies of scale play a part in making these events so big. But as organizer of Mojocon, I am not interested in profit, so I don’t have to pander to these scales of excess to cram as many topics and threads into our event, in order to draw as many people as possible. Rather than trying to bring twenty diverse topics together in one space to “grow” an event into a behemoth, I would much prefer to do twenty boutique events where the participants, speakers and exhibitors have a real opportunity to connect. A chance to share stories and actually chat and exchange ideas, not just exchange a cursory few words while you glimpse at a leaflet on the way to the next queue for another talk you will be excluded from because its over capacity. I have heard people say that they think a conference is worthwhile if you take away three ideas from it. If that is all attendees take away from Mojocon then I and the organizing team have failed. I want delegates to not have their minds opened to the possibilities but blown open with inspiration and ideas. Anything less would be a disheartening and disappointing result to me. 1. The plenary sessions with 40+ speakers on panels and fireside chats to learn from the experience of others. 2. The exhibition with 30 companies with products, accessories, apps which enable the professional production of content using smartphones and other consumer digital technology. 3. 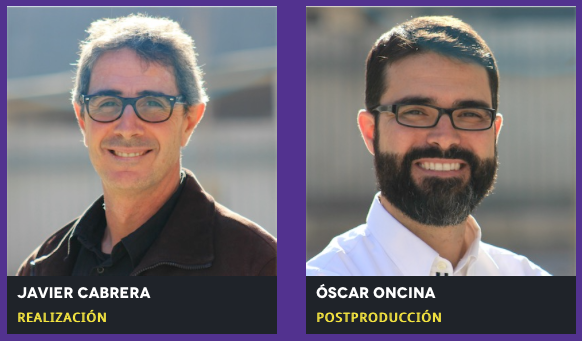 The workshop day where, if you were inspired on day 1 and bought some gear in the exhibition, you will have the chance to learn from some of the best and most respected mobile journalism and media trainers in the world. If you follow that process through to the end you can leave mojocon not with just three takeaways but with real skills and inspiration to start your journey as a mobile content creator. Who knows maybe next year you could be a speaker sharing your journey and experience with the #mojocon community*. Side note: As a spin off from Mojocon we created a group on Facebook to help build the community and keep the conversations from the conference going. The group now has over 750 members. You are welcome to join at http://www.facebook.com/groups/mojocon. Hope to see you in Dublin in April 29|30. PS. As a reader of my blog I’m giving you an exclusive tip about a St. Patrick’s Day promotion we will be running. Check out the video for details. So RTÉ have decided to run Mojocon again and I’m leading the project once more. I’m faced with a challenge, several actually, the biggest being: how do I make Mojocon2 even bigger and better than the first? Learn from your mistakes! To begin with I learned A LOT! I had never organized a conference before and quickly came to understand why there are usually lots of people involved in the planning and production. For Mojocon 1 the team that worked with me was Cliona O’Reilly and Roisin Cronin from RTÉ Technology and PR & Comms respectively and Sinead Cassidy a freelance event manager. In spite of all of our best effort Mojocon1 failed in one regard: it did not break even as we had hoped. The costs of flights and accommodation for44 speakers, the venue and catering, the staging and production and the unforeseen extras meant that we carried a modest loss on the event. A loss which I worked hard to recoup by delivering external training on behalf of RTÉ for the remainder of 2015. No panel will have more than 5 speakers with 4 preferred. I have only announced 17 speakers so far, there are at least that again yet to announce but it is going to be a VERY interesting few days. I also want to dispel the myth that this event is just for journalists. Mojocon 1 attracted media, NGO’s Businesses, PR Agencies, Marketing firms and the education sector. I’m working on special case studies which are directly relevant to these sectors as well as the broad range of media content we are putting together. Here’s just some of the companies already registered to attend. If you want to meet a substantial amount of the global mojo practitioners and influencers then you need to be in Dublin for Mojocon. They shot this really great mojo teaser about Mojocon for which I am exceptionally grateful. 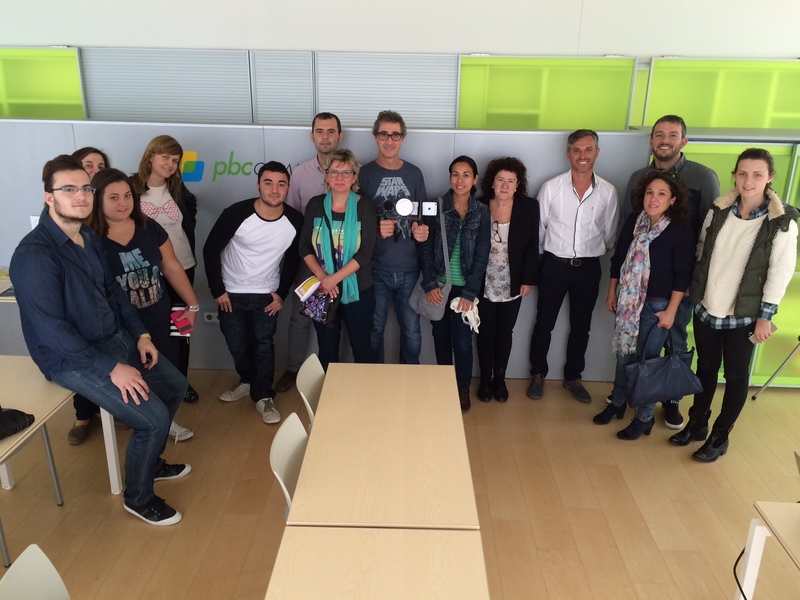 Based in Alicante, Spain they provide comprehensive mojo courses and production facilities. Their blog is a great source of information about Mojo, in Spanish and English. Earlier this year on the Mojocon Facebook group they posted a thread about using Switch Studio (aka RecoLive) with external devices, i.e. non-iOS devices. I asked would Oscar be interested in sharing his experiences via a guest post and he kindy agreed. A colleague of mine, Leola Lillis previously posted about Switcher Studio on this blog. 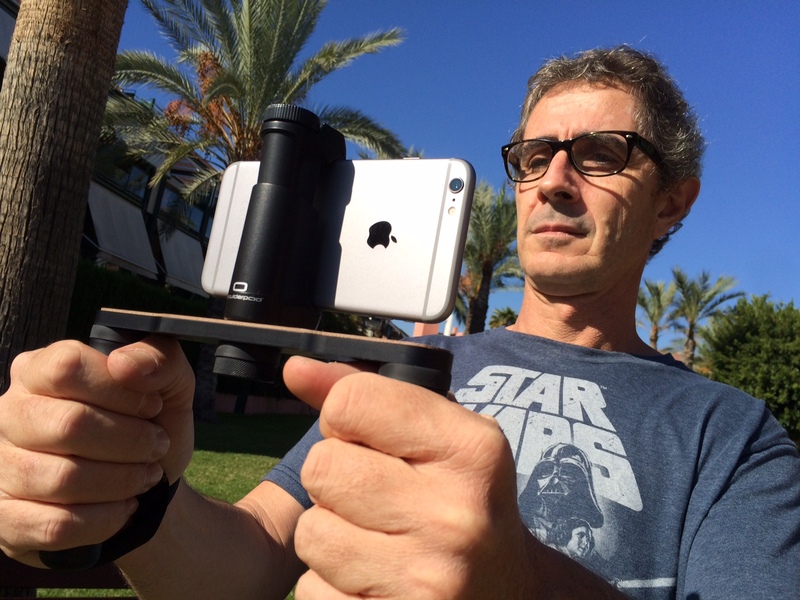 How to make a mobile multi-camera production with iPads, iPhones, or any other video source. Recolive Multicam is an application developed to record multi-camera productions using a WiFi network connection that allows you to sync up to 4 different video sources running on iOS and/or Mac devices. The norm is to use the built-in camera of your iPad as one of the cameras, and as the live mixer of all other video signals. Switcher Studio is a mobile video app that performs the same functions as Recolive Multicam, but additionally allows you to stream LIVE video while recording, as wells as, to view it using an HDMI adaptor or via Airplay. Check-out the following post to learn all about how I’ve managed to go further into the use of these apps by using an external video source that does not run on an iOS device. 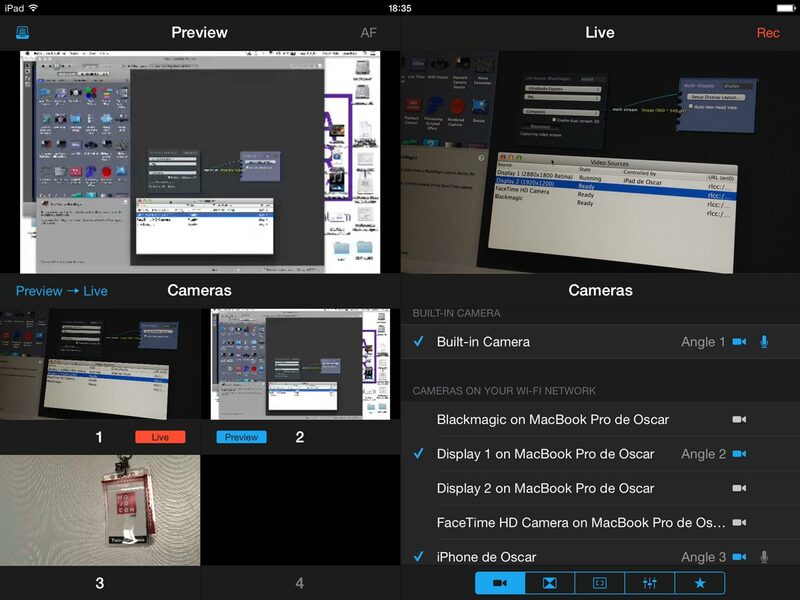 Recolive Multicam and Switcher Studio: multi-camera video apps. 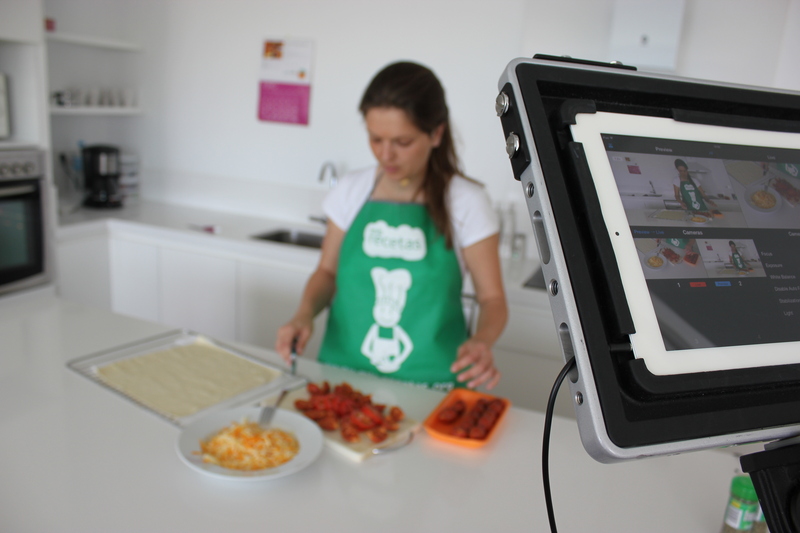 I have recorded many videos using an iPad4 and an iPhone 5S (https://www.youtube.com/user/cocinandoenvideo) with Recolive Multicam (http://eltalleraudiovisual.com/recolive-multicam-realizacion-multicamara-iphone-ipad/). This is without a doubt one of my favorite apps, because it allows me to have my own TV studio in the iPad. I can choose among the different video sources right there live; enhance the production with signs, tittles, headlines, overprinting or logos; use transitions; mix images Picture in Picture; or divide the screen; I may even select the device that will be the main provider of the audio signal. 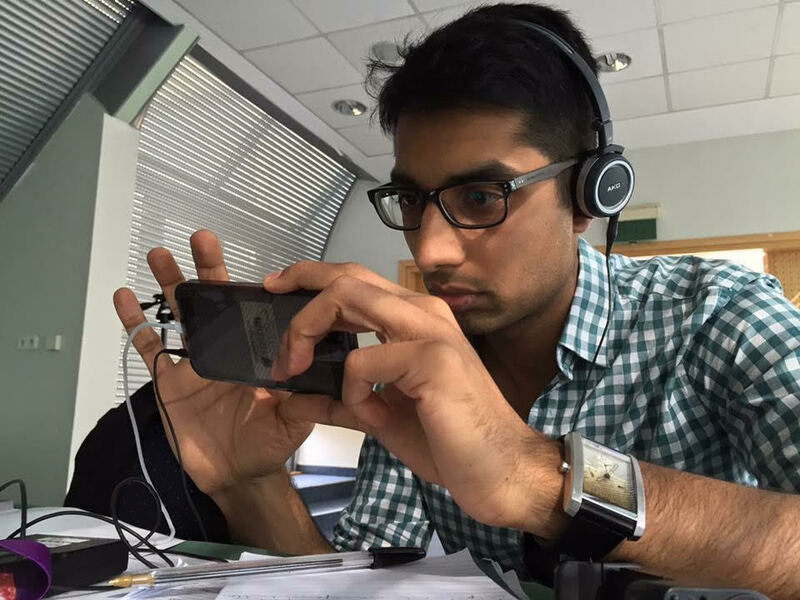 From now on, thanks to apps like this one – with a very simple learning curve-, anyone, either a person or an institution will be able to record cultural or sports events, interviews, round tables, or simply create video courses. Let me give you an example to illustrate it, with a challenge that I have taken on recently. – Finally, the third one would be the image provided by a trocar, or tube equipped with optical elements that sends images from the inside of the human body to a screen, guiding the surgeon during the procedure. As you have probably guessed by now, the problem is that the laparocopy video is not an iOS or Mac device, therefore, incompatible for the Recolive Multicam recording (the use of which would make them save a lot of money). As I’ve mentioned before, Recolive Multicam can only mix video sources from iOS devices using the corresponding app, or running it from Mac computers that have the appropriate free software, Recolive Capture (http://recolive.com/en/blog/40-recolive-capture), to share the screen or to shoot with the laptop camera. That seemed to be the solution. I needed video capture software that would preview full screen, but, none of the software that I tried, including BlackMagic Media Express, did the trick. I asked my streaming expert friends about it, but they could only advise about purchasing hardware, not software; therefore, the costs were skyrocketing. 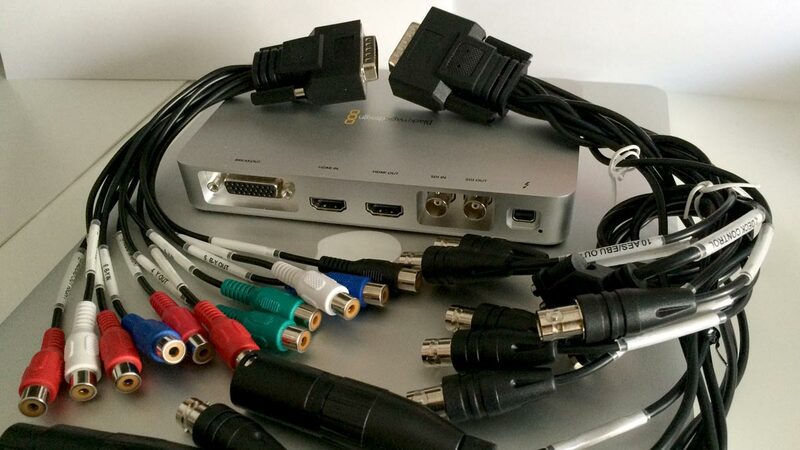 We could make full screen live preview from the capture card, FullHD (depending on the latptop and the source), by using the free software capabilities of Pixel Conduit. Let me fully describe all the steps taken in the test I run, and that I hope to be using very soon in an operating room. 1. Preparing images, lowers, and logos; saving them into the iPad that will be used as the mixer. 2. Setting up the video input from the Mac through Blackmagic Media Express and the video capture Blackmagic card. In this case, PAL 1920×1080. I will turn off the software once I see the signal. 3. Setting up all video sources, 2 iPhones and the Mac screen, through Recolive Multicam. 4. Setting up Pixel Conduit to recognize the video source coming from the Blackmagic card and previewing it full screen. See video, isn’t it simple? Silence in the set: 3, 2, 1… let’s shoot! 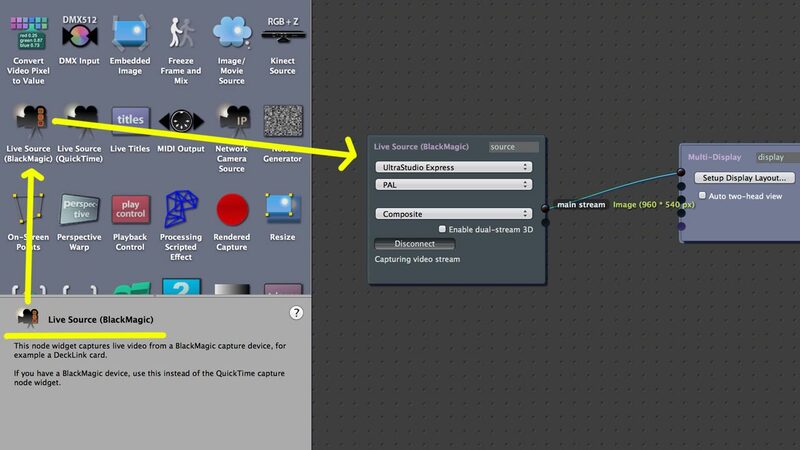 The option to use an external video source with Blackmagic capture card allows me to increase the options to shoot with several iPhone and iPad devices into any other video source. Furthermore, if you would like to shoot with several microphones and you have a sound table, you may use it as a mixing console for the audio signal, connecting the output of the table to the iPad mixer through a digital interface such as iRigPro or Shure MVi, or an analogic interface such as iRigPre or a Tascam iXZ. There is absolutely not a more affordable way to do up to 4 sources multi-camera productions. Those were the pros, but I should mention the cons, there is a minor audio delay, around 0,1-0,2 seconds, from the external video source that does not come from Mac or iOS devices. In this particular case, this will not be a problem for us, as the image from the laparoscopy does not have audio; although, if you would like to have someone speaking from that source, you will run into an unavoidable de-synchronization. Finally, Recolive Capture only shares the screen of the MAC computer, but not the sound. I hope that you will find this to be a useful post. I can’t wait to try this new option of multi-camera production in the operating room… Here is hoping that I will not faint while doing it…. I would like to thank Glen Mulcahy for his invitation to publish this translation in English of our article in his reference blog to all of us who record with our mobile devices. 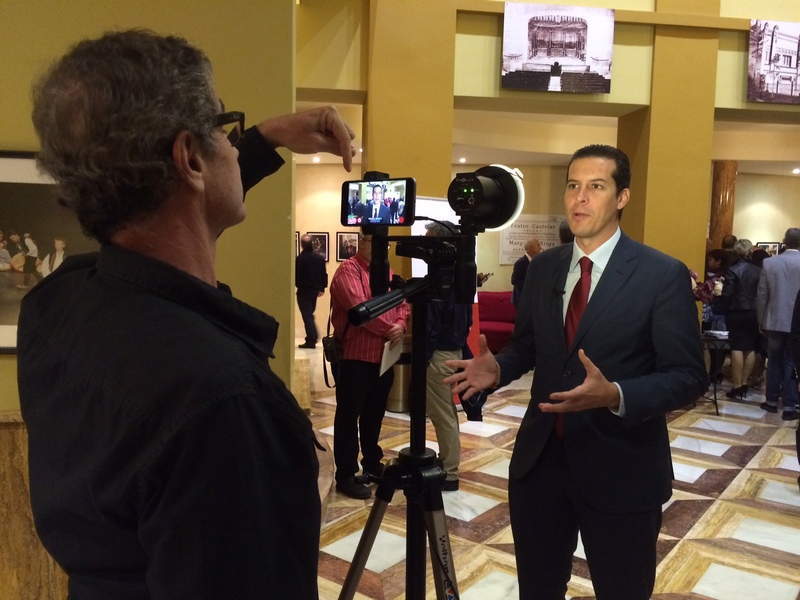 Thank you also to Gabriele Mondada, CEO of Recolive Multicam to always respond so quickly and so gracefully to all my questions. 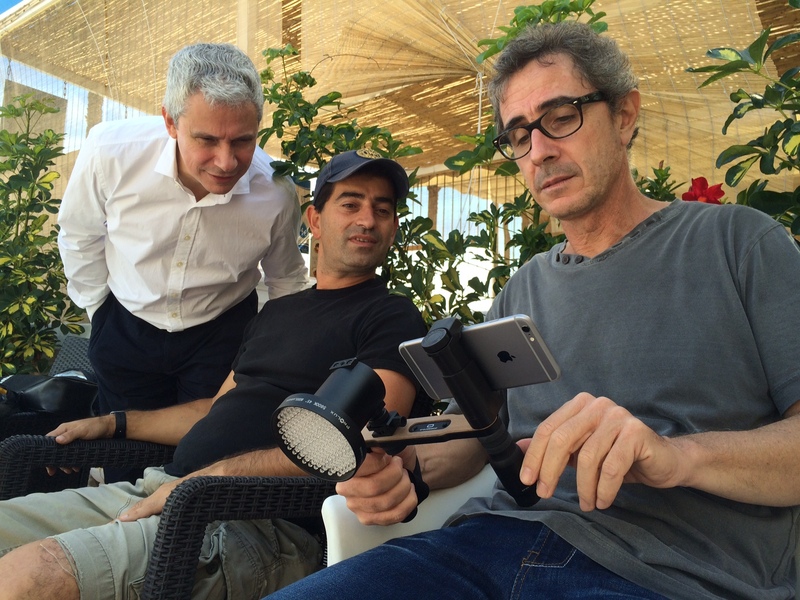 If you would like to read this post in Spanish, please visit our blog “el Taller Audiovisual” (http://eltalleraudiovisual.com/multicamara-con-ipad-iphone-y-cualquier-otra-fuente-de-video/ ), fully devoted to recording with mobile devices. 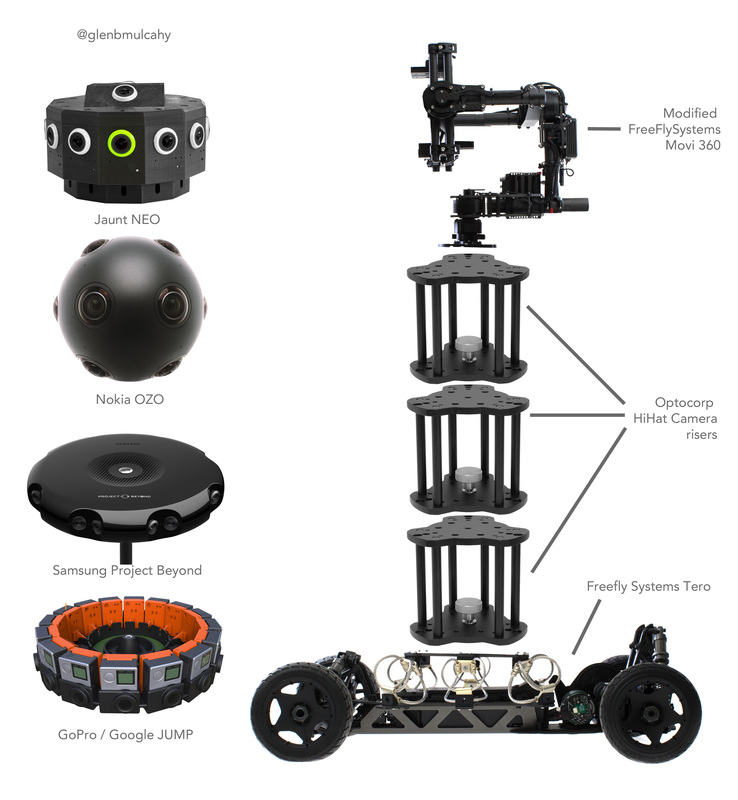 For the last two years I’ve been posting occasionally about 360º Immersive Video and VR. Last Christmas I bought a VSN 360 Camera. 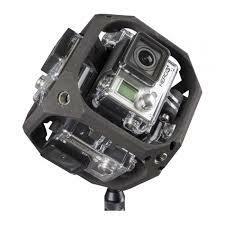 It was one of the first consumer grade/ GoPro price 360 cameras available. I also backed Giroptic in Kickstarter and subsequently preordered a 360Fly camera also. The 360Fly I bought came with a custom “Cardboard” viewer – which was a pleasant surprise! I’m looking forward to doing a “360 shootout” with these three consumer cameras once I have them all! YouTube now supports 360 Video via the Chrome Browser on Desktop or via their Android and iOS YOuTube Apps. The New York Times partnered with (in my opinion) leading VR production Studio, Chris Milk’s VRSE to create a second 360 Immersive Video. The REALLY exciting thing they’ve done though is to also partner with Google Cardboard to enable them to give away 1MILLION cardbards to their subscribers. This has prompted a lot of posts about being a milestone in the evolution of 360 Video/VR on its road to ubiquity. Last week at WebSummit I got to try out what will be the Public (Final) version of Oculus Rift with its hand controllers and I have to say it was the highlight of the conference for me. I joked to the Facebook operations manager that its obvious now: “You’re ultimate goal is to put a HoloDeck in everyone’s home” I have to say the experience was mind-blowing. I am still amazed and bewildered that GoPro have not released their own single camera 360 solution but as someone pointed put to me – Why would they? Right now they can sell 5, 6 or 16 GoPro Heros for a VR solution, why would they cannibalise that market with a single camera solution? Well I think they could get pipped by something like the Ricoh ThetaS which I also got to play with at WebSummit. I’m just back from a fantastic week in Budapest where I led the beginners training course of the Circom Regional / MTVA Mojochallenge. 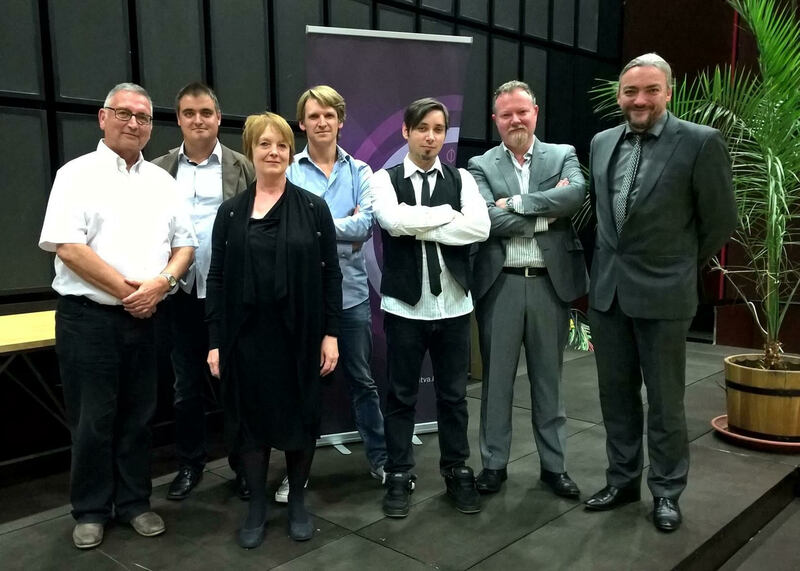 I was joined by some of the best mojo trainers in Europe, John Inge Johansen from NRK Norway, Guillaume Kuster from France Television, Darko Flajpan and Dado Pokec from HRT Croatia, Tibor Kormany from MTVA Hungary. 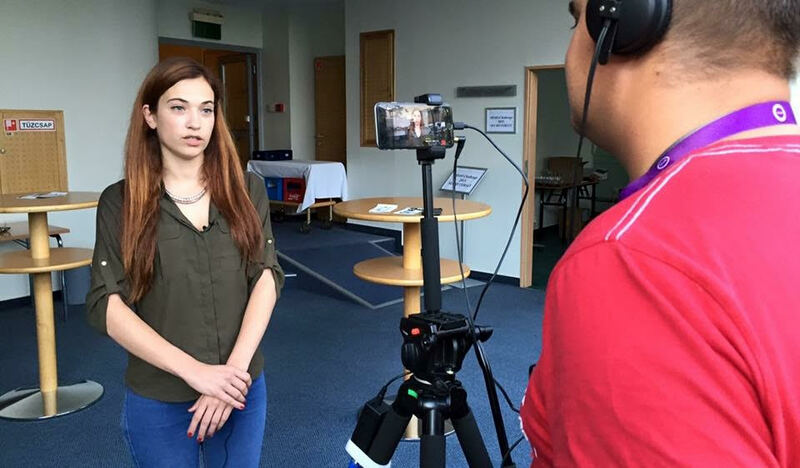 A total of 20 journalists drawn from stations and countries across Europe came to participate in the challenge. 10 beginners went through a very intensive 3 day mojo masterclass and 10 advanced participants (who had previously completed mojo training) were led through advanced editorial and storytelling by Karol Cioma, Training Manager with Circom Regional and Jane French from BBC. Tibor and Dado worked away on a behind the scenes video of the event and I think it really captures the spirit of the Mojochallenge. 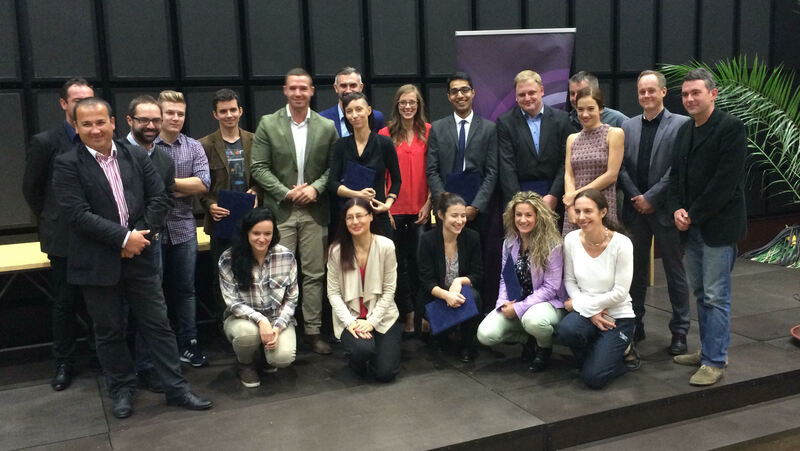 Thanks to the fantastic participants and trainers team for a truly wonderful experience.